Cult of the Artist: Giacometti, the Egyptian. this exhibition will open new perspectives by drawing our gaze towards the more formal essentials, away from the iconological mode of viewing works of art, thus allowing us to take a look at the artist behind the work. The Ancient Egyptians exerted an intense fascination over Alberto Giacometti, a fascination which was to last over several decades. 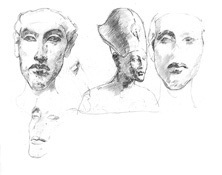 Countless drawings of Egyptian originals (including sculptures in the Berlin collection) bear witness to this fact; Giacometti mentioned Egypt time and again in his writings and interviews. Above all, it is his visualization of space through pictorial means, that shows his affinity to the Ancient Egyptians, whose art so much inspired him. What interested him the most was the figurative approach of the ancient artist, whom he saw, not as anonymous (in contrast to the commonly held view of Egyptologists), but as an individual, and someone who had wrestled with form and style no less than he himself had. Works by Giacometti from the 'Sammlung der Alberto Giacometti-Stiftung' in Zurich, now integrated into the sculpture halls of the Egyptian Museum's permanent exhibition, invite visitors to listen to a dialogue between artists, as they communicate with each other in a common language of forms, which traverses several millennia. Giacometti's work, having been placed in these surroundings, reveals how steadfastly it is rooted in the past, as well as allowing the art of the Ancient Egyptians to, once again, exude an extraordinary freshness and relevance. Maurizio Nannucci's 'ALL ART HAS BEEN CONTEMPORARY', which is displayed outside of the museum, can be taken as an appropriate invitation to 'GIACOMETTI, THE EGYPTIAN'. 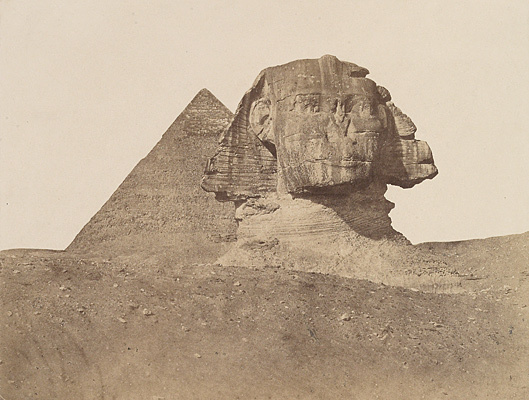 To travel to Egypt in the 19th century meant, then as today, to visit the Pyramids and the Sphinx of Giza. These archaic monuments pointing to ancient 'biblical' times were considered to be the greatest enigma created by human means. Those who waded through he sand to the sphinx or who climbed the Cheops pyramid wanted a photo as prove and remembrance of the event. This service was provided from the 1860's, by photographers who opened ateliers at the major tourist centres. In this exhibition ca. 60 photos taken between 1852 and 1900 large formate vintage photos and stereo photographs as well as calling cards and picture postcards can be sen . According to the theme of this year's 'Month of Photography ' many of the photographs have not been exhibited before. The photographers, on the other hand, are well known to the connoisseurs: R. Murray, J. Robertson & F. Beato, F. M. Good, W. Hammerschmidt, A. Beato, F. Bonfils, P. Sébah, L. Fiorillo, Gebr. Zangaki, G. Lékégian, Abdullah Frères, H. Arnoux. 5000 Jahre Afrika | Ägypten | Afrika. 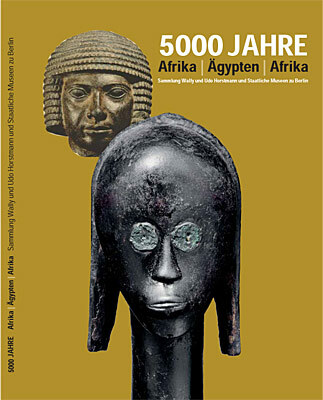 Poster of the exhibition "5000 Jahre"
The great interest in African art is in part due to its influence on modern art : African art in the context of contemporary art is a familiar experience. The Collection Horstmann shown here offers an opportunity for a dialogue with a different art. The masterpieces collected over decades by the Horstmanns according to artistic criteria meet ancient Egyptian art. 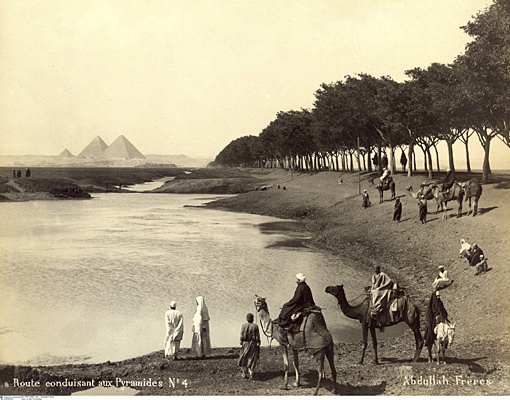 The exhibition in the Kulturforum does not show a historical linear connections or ways of cultural transfer but by the intimate placement of the African and ancient Egyptians works of art, the formal and stylistic analogies become visible. Two goals are pursued: on the one hand to expose the roots in - and the radiation to - Africa, and by displaying the artistic perfection of ancient Egyptian works of art to provide an invitation to discover the comparable perfection of the African artist. So two components are fused to a coherent harmony : the richness of the Collection Horstmann and the works of the Egyptian Museum Berlin (SMB).